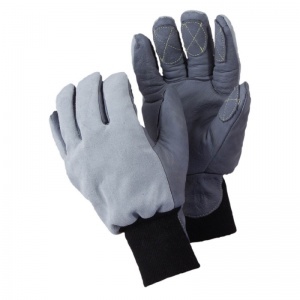 Featuring a waterproof leather palm to keep hands warm during use, the hardwearing Flexitog Aquatic Insulated Freezer Gloves FG655 offer superb performance in cold, wet and freezing working conditions. They use hollowfibre insulation to trap air and increase warmth, while the comfortable dual thickness cow leather aids durability, meaning that the gloves are highly long-lasting. The Flexitog Aquatic Freezer Gloves use a dual thickness cow leather liner to offer exceptional durability in low strength areas, while their wing thumb design prevents wear and tear in the major wear areas on the gloves. This ensures exceptional protection and longevity, while the waterproof leather palm protects the hands from wet conditions. The Flexitog Aquatic Freezer Gloves are available in three sizes that should be suitable for most users. To find your perfect pair, please measure the circumference of your palm and match the results to the table below.